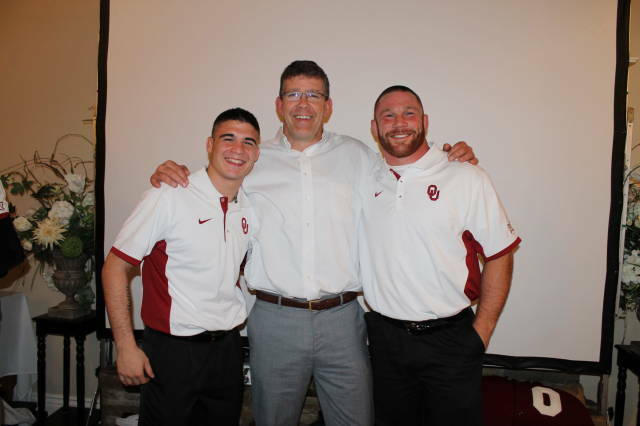 The University of Oklahoma wrestling team celebrated the 2015-16 season on Friday evening with its annual spring banquet, held at the Cobblestone Creek Golf Course. The Sooners were joined by friends, family and fans to highlight the past season’s achievements with dinner, awards and a social. Several wrestlers received awards handed out by head coach Mark Cody, associate head coach Michael Lightner, assistants Andrew Howe and Kendric Maple and trainer Chris Watson. Departing senior Cody Brewer received the program’s Most Outstanding Wrestler award following a 25-3 season and a third-place finish in the 133-pound division at the NCAA Championships in New York City to become the program’s 11th four-time All-American. The Kansas City, Mo., native also received the Jimmy White Award, given to a wrestler on the basis of athletic ability, team contribution, individual achievement and team spirit. Fellow senior Mike Brown was named the Sooners’ 11th man, recognized for his efforts as the back up at heavyweight. On the season, Brown went 3-3. He was also given the Athletic Council Achievement Award. Davion Jeffries was honored with the Jay Meyers award, presented to the team’s most outstanding freshman. Jeffries posted an 18-11 record in his rookie season, was the 2016 Big 12 runner-up and made his first NCAA Championships appearance at 149 pounds. Redshirt junior Clark Glass (165 pounds) was presented the Warrior Award for his efforts on the mat and stepping up to the occasion. Glass, who made his second NCAA Championships appearance, finished the season with a 21-10 mark. The Brandon, Fla., native was also named the Sooner Student-Athlete of the Year for his success both in the classroom and on the mat. Ryan Millhof was named the Most Improved of the season after posting a 21-7 record. The sophomore was the 2016 Big 12 Champion at 125 pounds and earned first-time All-America status, placing seventh in his first NCAA Championships. Redshirt junior Ross Larson tallied 10 pins on the season to receive the Most Pins award for the program. He finished the year with a 20-13 mark. The Redshirt of the Year honor went to freshman Christian Moody. OU’s two seniors, Brewer and Brown, were celebrated for their contributions and commitment to the program throughout their careers. The Sooners’ letterwinners were also recognized during the event. Oklahoma recorded a 10-5 record in the 2015-16 season, including five wins over ranked opponents. The Sooners finished with a 13th-place finish in the NCAA Championships in New York City.